Over the past few months, I have been receiving more and more questions about how to advertise a quilting business – whether it's a machine quilting business, a quilt shop, selling quilts, or even an online quilt store – via the Internet. It seems that more and more people are taking their offline businesses into the online world. Banner Advertising: Banner advertising is graphical in nature. If you've been online for any amount of time, you've seen these advertisements on any number of web sites. Banner ads are usually sold either on the basis of impressions (the number of times the ad is shown) or for a flat monthly fee. Costs for these types of ads vary WILDLY, with some sites offering inexpensive monthly advertising rates, while other demand $100s or $1,000s and the rates are based on the number of times the ad is shown. Pros: These ads, when done correctly, can draw the web surfer's eyes and really catch their attention. Graphical banners can also quickly display a lot more information than can be conveyed with text in the same space. Cons: First off, the banner itself requires someone with graphical design experience to be effective. In addition, it is now harder than ever to command the attention of jaded web surfers, often requiring animation. 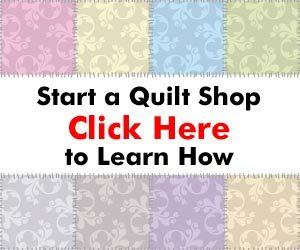 Where to Advertise: You need to advertise your quilting business on sites that cater to your potential customers. You need to figure out who your potential customer is (i.e. engaged couples for memory quilts), and find the sites where they are searching for information AND that offer banner advertising. Pay Per Click Advertising: Pay Per Click (or PPC) advertising are those little text ads you see above and to the right of your search results on the major search engines. As an advertiser, you decide which keywords (the search terms typed into search engines) you want to advertise for, and as the name implies, you pay only when someone clicks on your ad. Depending on the keyword and how competitive it is, the cost of the clicks goes up. For example, the keyword “quilting” might cost $.50 per quilt, but the keyword “quilting in New York” may only cost $10. Pros: If done correctly, PPC advertising can be very cost-effective and very profitable. And, paying only when someone clicks means that you only have to pay for people who actually see your ad and are interested enough to click and visit your site. Cons: PPC advertising, when done incorrectly, can be VERY expensive. If you do not watch what is happening with your ads, and don't set budgets, you can waste a lot of money on bad clicks. You also must be able to convert those clicks that visit your site into sales. Ezine Advertising: One of the most effective methods of advertising online is to advertise via an email newsletter, or “ezine.” Many web sites will maintain a email list so that they can communicate with their customers and readers. Some of these ezines allow advertising by outside parties for some kind of one-time or multiple-time fee. There are different types of ezine advertising, including different spots in a regular ezine (i.e. weekly ezine), or a one-time mailing to the person's list. Advertising rates depend on the number of subscribers, the popularity of the market, and the type of ad. Pros: Ezine advertising can be very effective as you usually have some room to explain your product or service, and you can pre-sell the prospect via this ad. This makes them more receptive when they click through to your web site. Also, most ezine advertising is very cost effective, with some very popular ezines charging only $25 or $50 for an ad. Cons: As with any marketing, you need to be able to write effective marketing copy to get people to click through to your web site. And, if they don't click through while reading that issue, and delete the ezine from their email inbox, your ad will not appear again. You need to capture their attention immediately. Where to Advertise: Again, you need to find out where your customers go online, and find the web sites that offer an email newsletter and will let you advertise. your very own quilting business. Other Online Marketing: There are a number of other opportunities online, including search engine optimization, joint ventures, affiliate programs, Pay Per Action (PPA) advertising, and more. These strategies are generally for more experienced online marketers, so I won't go into detail. Just know that they are out there as you develop your skills as an online marketer. Online advertising and marketing requires just as much, if not more, study and practice as traditional offline advertising. There are a number of valuable resources available to help you on your way. I will be discussing my “Top Ten List” of Internet marketing resources in another article. PLEASE NOTE: This article and product review archive is here for your benefit. If you would like to use any of the articles or product reviews on your own web site or in your own email newsletter, you must include the resource box at the end of the article and also contact QuiltingBusiness.com requesting permission. Recently I attended a seminar/selling-job presented by StoresOnline. Are you familiar with their operation? Much of what I’ve just read was presented there, with considerable detail of how this works. At first I bought into it, and put down my money. Then I realized that I haven’t the time to devote to an online business and run the storefront I already have, and cancelled. You’ve got a great site here…most helpful information. Thanks. those are some great ideas for advertising your quilt business. thanks!